Redox Tech feels that ABC and ABC+ are superior products for bioremediation. Nonetheless, we recognize that many companies have already permitted sodium lactate for their projects. 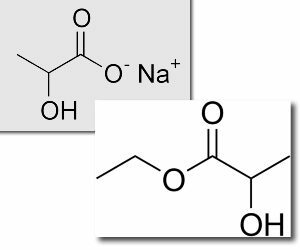 Given the enormous amount of lactates that Redox Tech purchases, we can also offer sodium lactate and ethyl lactate as pure products. We feel that ethyl lactate is superior to sodium lactate, so you may wish to consider that in the future over sodium lactate. The use of ethyl lactate is covered by our exclusive patent to the Semprini et al patent issued by Oregon State University. Different microorganisms compete for the same food source. For example, both dechlorinators (the ones that degrade chlorinated organics) and methanogens (the ones that produce methane) can use hydrogen released from food sources as electron donor. At low hydrogen partial pressure, dechlorinators outcompete methanogens. Whereas at high hydrogen partial pressure, most of the hydrogen is wasted by methanogens and dechlorinators can’t thrive (Fennell et al., 1997; Smatlak et al., 1996; Yang and McCarty, 1998) . It is important to deliver a food source to subsurface such that a low hydrogen partial pressure can be maintained to impart a competitive advantage to dechlorinators. One of the most effective food sources for dechlorinators are fatty acids, such as sodium lactate or ethyl lactate. Both sodium lactate and ethyl lactate are commonly used as food additives and therefore readily available, environmentally benign, and fairly inexpensive. Upon contact with water, ethyl lactate slowly hydrolyzes to ethanol and lactate, which can both serve as electron donors for anaerobic biodegradation. The electron donor capacity of ethyl lactate is about twice of that of sodium lactate given the same mass (Table 1). On the other hand, sodium lactate releases sodium and lactate. Obviously, sodium does not serve as an electron donor. The viscosity of 60 percent sodium lactate solution is about 30 times of that of 60 percent ethyl lactate solution, making the injection of former much harder than the latter (Table 1). The density of 60 percent ethyl lactate (1.03 g/mL) is closer to that of water than the density of 60 percent sodium lactate (1.32 g/mL), therefore the former would result in a less extent of density-induced fluid under-ride during injection. Fennell, D.E., Gossett, J.M. and Zinder, S.H., 1997. Comparison of butyric kid, ethanol, lactic acid, and propionic acid as hydrogen donors for the reductive dechlorination of tetrachloroethene. Environmental Science & Technology, 31(3): 918-926. Smatlak, C.R., Gossett, J.M. and Zinder, S.H., 1996. Comparative kinetics of hydrogen utilization for reductive dechlorination of tetrachloroethene and methanogenesis in an anaerobic enrichment culture. Environmental Science & Technology, 30(9): 2850-2858. Yang, Y.R. and McCarty, P.L., 1998. Competition for hydrogen within a chlorinated solvent dehalogenating anaerobic mixed culture. Environmental Science & Technology, 32(22): 3591-3597.